GOP Rep Intros Resolution To Drug Test Congress - Joe.My.God. 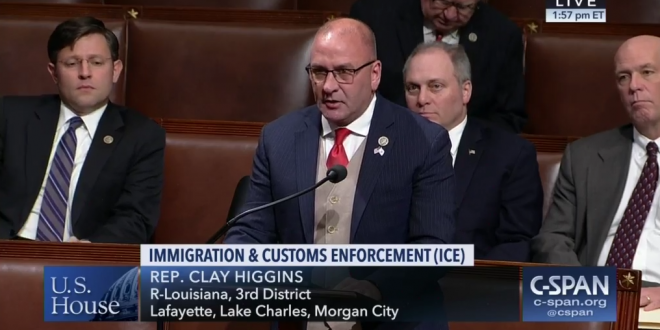 Rep. Clay Higgins has an idea for how to get Congress to clean up its act: random drug screenings. “I have observed some behavior that would cause one to wonder,” Higgins, a freshman GOP congressman from Louisiana said, apparently joking. But his legislation to proposal to test senators and House members for drug use once per term is no joke. On Thursday, Higgins introduced House Resolution 135 to do just that. “Elected officials in Washington, D.C. should be subject to the same kind of random drug screenings that blue-collar, working-class Americans have to endure,” Higgins said in a news release. Members of Congress would have to reimburse taxpayers for all costs of the program under Higgins’ legislation. If a member tested positive for illegal drug use, he or she would be reported to the Committee on Ethics. Those investigations aren’t open to the public. Higgins first appeared on JMG in July of last year after narrating a pro-military video from inside the gas chamber at Auschwitz, a stunt which earned him the condemnation of the Holocaust Memorial.